A moment with Nannette Deasy of WOW WEE! ADVENTURES OF A LITTLE GIRL KILLBOT! We love the diversity and fearlessness of the work and communities that surround Fringe Festivals. They are sooooo much fun! Portland, Maine, is also a can’t-be-beat destination! It was born from a show born from a show born from a show! The main character, Andie the Android, was referenced in the joke bio of a character, Bonnie Winters, I played in another show years ago, “Match Wits” (a show that was actually conceived and directed by the director of Wow Wee, Curt Dixon). Bonnie was a “celebrity contestant’ on a “70s gameshow” whose main claim to fame was being a former child star on an 80s sitcom called “Wow Wee! 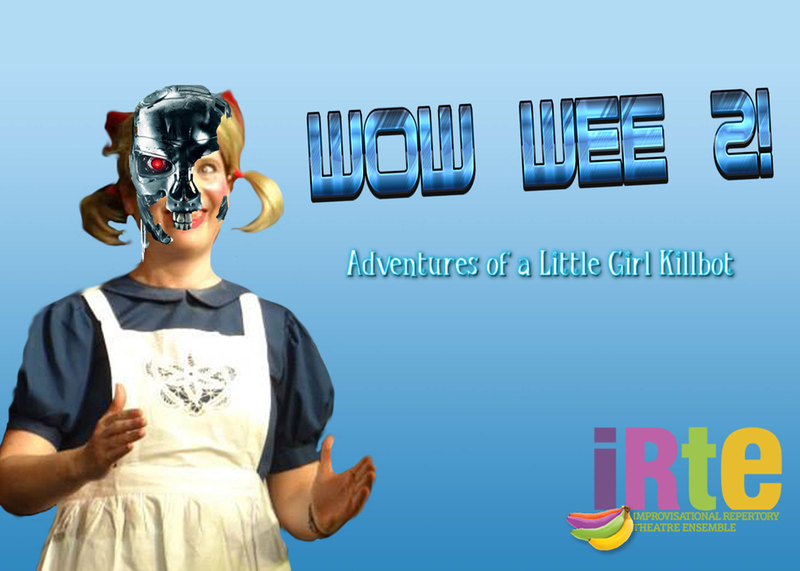 Adventures of a Little Girl Robot.” Eventually, the members of IRTE decided to perform this totally made up “sitcom” as one our shows a few years ago. This year, we thought it would be fun to bring the show back, but set it in an 80s apocalypse. There’s all sorts of references to Terminator, Small Wonder (an actual 80s sitcom featuring a “little girl robot”), Thornton Wilder’s “The Skin of Our Teeth” and even Frankenstein. Sometimes it feels like the world is racing ahead of itself faster than we can handle – that technology is outpacing human ability, common sense and just plain decency. How would you describe your show to your mom? I’d tell her it’s a sitcom starring her favorite actor – ME! I’d say, “Honey, you know what this show’s about. You’re in it!” (my crush is my husband, who is also in the cast). A Very MTWTFSSSpooky Halloween Show That Definitely Doesn’t Involve Murder. Like, At All. SEE WOW WEE! ADVENTURES OF A LITTLE GIRL KILLBOT AT PORTFRINGE 2018!